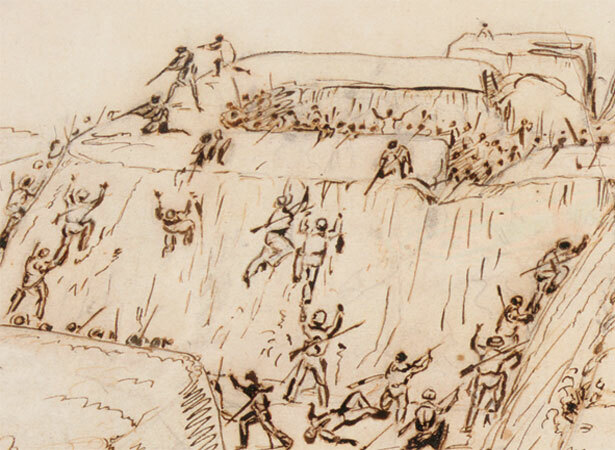 More British soldiers were killed at ‘Bloody Rangiriri’ than in any other battle of the New Zealand Wars, but their victory opened the Waikato basin to the imperial forces. Following the invasion of Waikato (see 12 July), Māori had built a defensive line across a narrow strip of land between the Waikato River and Lake Waikare. The central redoubt, the work of the chief Te Wharepū, was a carefully hidden trap with concealed firing positions. But the formidable fortification was incomplete. It was also under-manned, with only about 500 fighters present, one-third of the British strength. The prolonged defence of Meremere had stretched Māori resources – and it was planting season. On the afternoon of the 20th, imperial troops were landed by boat behind Māori lines and the outlying earthworks were cleared. The central position remained unbreached despite repeated frontal assaults. Forty-seven British and 35 Māori were killed in a few hours. At daybreak the 180 Māori still in the pā raised a white flag, possibly in an attempt to negotiate. Instead, the British took them captive. We have 17 biographies, 13 articles, related to British capture Rangiriri.